When your lawn is not as organic and healthy as you desire it to be, it’s important to decide on the best course of treatment. Do you turn on your sprinkler and hope hydration solves the problem, rely on chemical treatments or investigate more effective organic plus lawn care techniques as a solution? 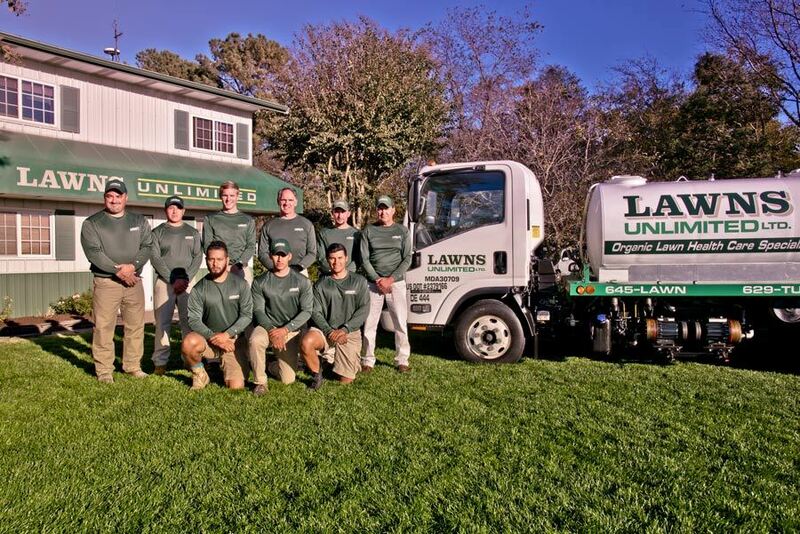 Lawns Unlimited provides organic plus lawn care services and natural lawn fertilizer applications with slow release, non-burning plant food that greatly strengthens your lawn. Over the course of treatment, your lawn benefits from thick, green grass and reduced thatch. Organic plus lawn care adds nutrients to your soil that help stabilize pH levels, making soil healthier for turf growth. Soil treated with organic-based methods produces higher levels of nutrients and minerals. Consequently, grass that grows in organically treated soil is thicker and easier to maintain without chemicals. What is the best lawn maintenance routine for my home? Can it be organic based? Using organic based lawn fertilizers to treat your soil causes a slow release of nutrients that allows grass roots to absorb them systematically. Roots become stronger and more fibrous, which results in a lusher organic based turf. Organic based lawn care products create consistent growth during the entire growing season and a healthier plant. Quick release fertilizers will over stimulate growth and cause issues such as extra clippings, insect infestation and disease. Plant health begins with the soil. Bio nutritional products feed the soil with microorganisms and nutrient enhancers. With these Bio nutritional fertilizers constantly building the soil profile, the turf can yield optimum health, quality, color, and controlled growth. Selective use of plant health care products delivers a more beautiful and healthy lawn while managing lawn threatening pests with very little chemical intervention. It gives your lawn the care it requires, while caring for both the community and environment in a professionally sound way. Organic based lawn care is not harmful to pets and wildlife because the proper application of organic based fertilizer does not cause concentrated excretions of bio-hazardous elements such as nitrogen. Watch Your Organic Plus Lawn Flourish Over Time! When you treat your lawn using organic-based methods, your turf, and outdoor living space grow greener and more beautiful over the years while you reduce your impact on the environment. We take great pride in our professionalism for each and every job we do.